They are occupying the semi-fixed location that Viva Las Arepas once was (now moved down the street to an actual dining room), right out front of Dino’s, conveniently located near the Olympic Gardens gentleman’s club and plenty of the garish kind of weekly-rate motels that make up that part of Vegas. 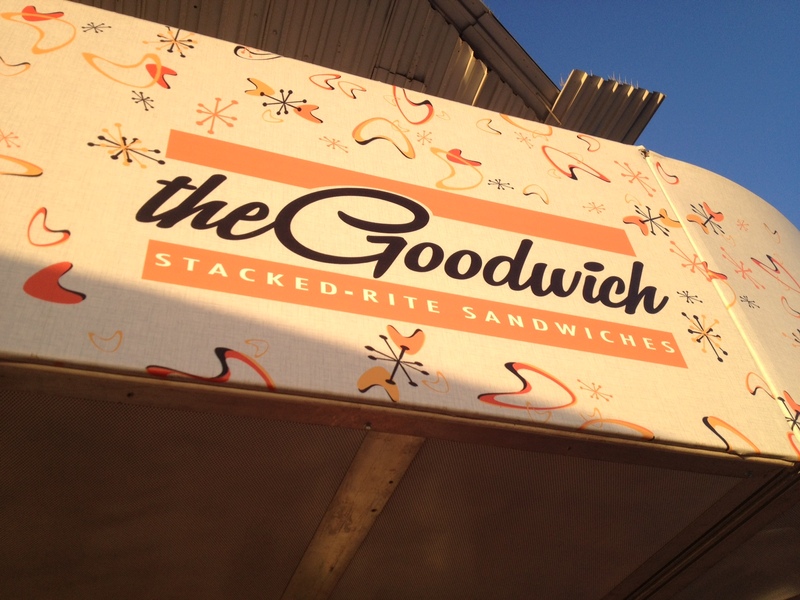 The Goodwich space is nothing more than a window to order from a a few chairs to devour your sandwich in. What little decor there is is very hip 60s Atomic Age stuff. 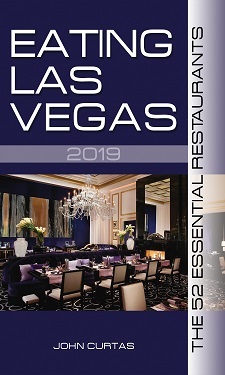 It is quite the contrast to the area, but there is a consistent group stopping in for a bite. $5 STUFF: There is a sandwich in this category I am seriously considering the best sandwich I’ve had in years. My usual go-to for an amazing sandwich is on the semi-secret menu at the Carnevino bar, a dry-aged pastrami sandwich with grilled tomatoes and arugula. That and one of Good Ol’ Coop’s perfect Negronis is a great meal, even at something of a shocking price tag. But for the Goodwich “Ham &” to surpass that at just a fiver? You’ve got the salty, savory ham, and they pair that up with aged cheddar, and a house made mostarda (dried blueberries, cranberries, apple, etc. cooked with mustard vinegar, sugar, and wine). Blew my mind, probably the best danged deal in town, and I mean that with honesty. Get that one, now, today. Go. 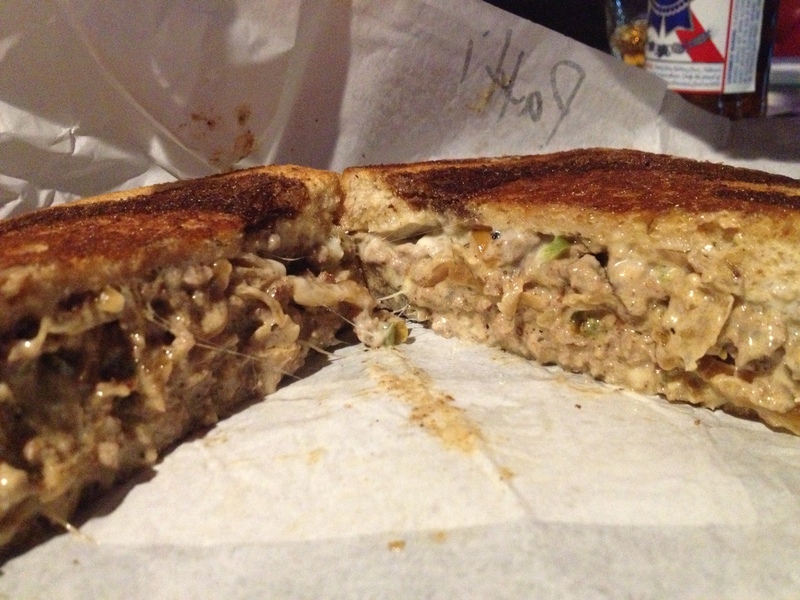 $9 STUFF: Oh la la, a sandwich with foie gras mousse? Could this be really good or really awful? There has been a trend of really awful “dive-y” food with foie gras on it, so how does their “Foie &” faire? The mousse is done quite well, preserved the overall rich flavor, the port-braised cabbage is a great sweet/bitter addition, the almonds elevate the flavor well and add texture. And the crispy chicken skin (add to any sammy for $2!)? Well that is what a wise man once called “Money”. Get the “Foie &,” not so you can say “lol foie gras sandwich! XD #selfie #foodporn #sorrynotsorry”, but because it is most definitely a good experience. The “Span-ish” and “Le Pig” are both just as good as the foie, and definitely indicative of the immense level of passion and thought the two owners put into their sandwiches. A lucky star must hang over that little shack in front of Dino’s. Lucky for the owners (Josh Clark and Jake Leslie) — who have and most certainly will be heading to do big things with their food, but even more lucky for the people who get to eat there. The Goodwich is coming at a time when everyone is scrambling to open a Downtown restaurant, and so many (especially any of the hokey ones they just opened in the Grand or Plaza or whatever else) are not guiding things in the right direction. If we had more places like The Goodwich, we would be sitting pretty, and downtown would really be giving The Strip a run for its money! 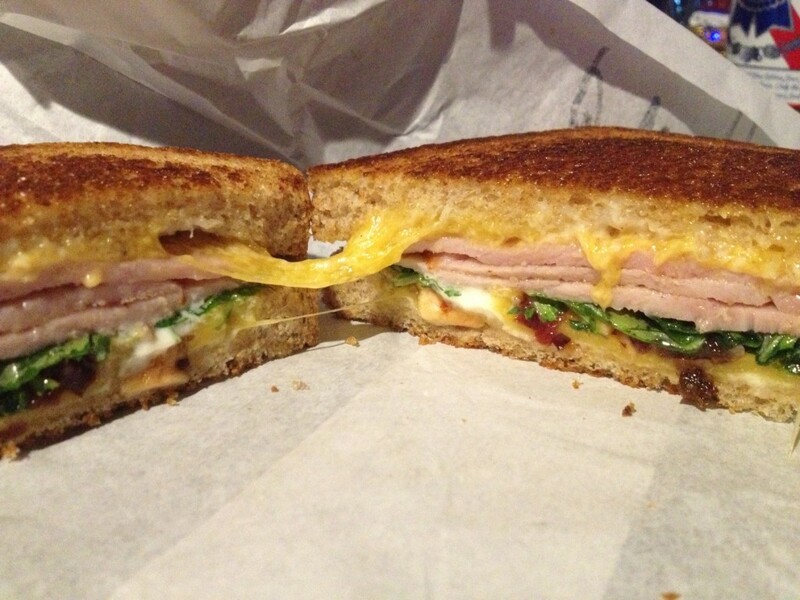 Favorite dishes: Gosh….I don’t know….maybe you should get…A SANDWICH!??! After reading this review, I’ve eaten there twice in the last two days. This may have been a life-changing experience.